The 12th annual Sydney Comedy Festival will bring more shows, more laughs and even more absurd hilarity than ever before, when it kicks off next week across the city and beyond. 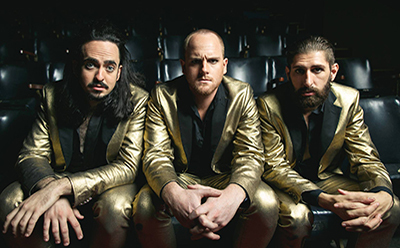 In 2016, the Sydney Town Hall joins the Festival with a line-up of epic proportions, including: Ross Noble (UK) with his new show, Brain Dump; ABC TV’s Good Game Live where the hosts and special guests test their gaming cred and improv skills; and Giant Dwarf’s special fundraiser edition of Story Club, raising funds for Marrickville Legal Centre to help those in need. Sydney Town Hall will also host the Festival’s biggest ever children’s program, Comedy For Kids!, delighting young audiences with interactive fun and silliness during the school holidays at the Jungle. By night, the Jungle loses its PG rating and becomes the Late Night Club hosted by Rhys Nicholson and featuring performers such as Marney McQueen, Andy Dexterity, Craig Hill and Brett Bower alongside an array of musical acts, cabaret, illusions and wildly funny sketch comedy. Taking place at The Factory in Marrickville’ will be Australia’s Funniest Shorts – a film festival that provides emerging comedy filmmakers with a platform for the production and presentation of short form comedy. While Redfern’s Giant Dwarf will host Bonus Stage – a live talk show just for gamers including special guests from the world of comedy, television and most importantly, video games. Returning to the Festival at the Enmore will be crowd favourite, Frocking Hilarious – an un-missable show featuring hilarious female comedians supporting ActionAid Australia’s work to empower women living in poverty to stand up for their human rights. An abundance of late night fun will also be on offer at the Enmore with the Festival Club Comedy Up Late! delivering a surprise line-up of Festival favourites to entertain insomniacs, comedy die-hards and anyone not ready to call it a night. Local stars not to be missed include: Em Rusicano, Nazeem Hussain, Rhys Nicholson, Matt Okine, Sam Campbell, Alice Fraser, Sammy J & Randy, Susie Yousef, Tripod, Tom Ballard, The Bear Pack, Tommy Little, Peter Helliar, Kitty Flanagan, Justin Hamilton, Nath Valvo, Michael Hing, The Axis of Awesome, Aunty Donna and many more. The 12th Annual Sydney Comedy Festival runs 18 April until 15 May 2016 at venues throughout Sydney. For more information and complete program, visit: www.sydneycomedyfest.com.au for details.